ST. THOMAS, USVI (March 27, 2010) – Typically, a reference to “battle of the Melges” conjures up images of a sail-off among like one-design boats, but tomorrow at the International Rolex Regatta, it will mean that Chris Stanton’s (Christiansted, St. Croix, USVI) Melges 24 Devil 3 will have to fend off a Melges that is eight feet longer to win. Going into today, Dave West’s (Road Town, Tortola, BVI) Melges 32 Jurakan was leading in the CSA-handicapped Spinnaker Racing 2 Class but tied with Devil 3 on points. When Devil 3 added finish positions of 1-2 to its score line today, it not only broke the stalemate with Jurakan, which posted a 4-1, but also established a two-point margin on the leader board. The course for Stanton’s second race today took him to the southern coast of St. Thomas’s neighboring island of St. John where his team enjoyed long reaches that required lots of navigational decisions, local knowledge and consideration of current. It was likewise for the IRC class, where Richard Oland’s (Rothesay, NB, CAN) Vela Veloce is now tied on points with Austin and Gwen Fragomen’s (New York, N.Y.) Interlodge for the lead. “It was beautiful and let us see some country we would not have gone to see,” said Oland. As for tomorrow, Oland’s situation is indeed more boat-for-boat than Stanton’s, since Vela Veloce and Interlodge are the same size. “The question is how well will each of the teams sail,” he said, adding that he thinks his team is primed for rising again to the occasion, continuing its good starts and tight teamwork. 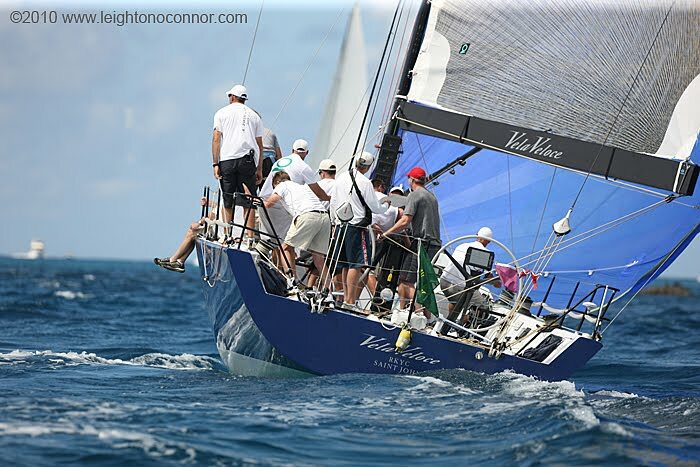 The IC 24s, which had snuck in an extra buoy race yesterday after the rest of the fleet headed home from the races to Charlotte Amalie and back, managed eight races today. Leading the 15-boat fleet is Puerto Rico’s Fraito Lugo aboard Orion, but with as many races likely for tomorrow, it’s anyone’s guess whether Lugo can hold out against the great depth of talent in this class. Elizabeth Brookes’ Farr 65 Spirit of Isis (Antigua) leads CSA Spinnaker Racing 1, while Antonio Sanpere’s (Christiansted, VI) J/36 Cayennita Grande has maintained his lead from yesterday in the CSA Non-Spinnaker Racing Class. John Holmberg’s (St. Thomas) Hobie 16 Time Out now leads the Beach Cats while James Dobbs’ (Antigua) J/122 Lost Horizon is leading Spinnaker Racing/Cruising Class.